The accordion is an important instrument in Irish Traditional Music, including the ever-popular Ceili style, as is the concertina, and has been since its arrival in the country in the latter half of the nineteenth century. The ten-key form of the instrument (the melodeon) is still played in some parts of Ireland, most notably in Connemara, though most Irish musicians prefer the more standard two-row button version or the Button and Piano Accordion. Unlike comparable instruments used in other American and European music genres, the two rows are tuned so that just a semi-tone separates them. This means that the melody of the tune can be played chromatically. Generally speaking, the most popular tuning combinations are the B/C and the and C#/D. An instrument tuned to B/C is ideal for a more fluid style of playing, such as that made popular in the 1940s and 1950s by the Tipperary-based musician Paddy O’Brien and subsequently Sonny Brogan and Joe Burke in the 1950s and 1960s. Dublin-born James Keane transported the instrument across the Atlantic, where he used it during his important performing and recording career. Other notable proponents of the B/C version include Bobby Gardiner, James Keane and Finbarr Dwyer. Conversely, the the C#/D model is far more suited to a rather edgier and more punchy style such as the wonderful Kerry polkas. Over the course of the 1950s, the Button and Piano Accordion became increasingly popular among traditional Irish musicians and continues to be so today. It had become synonymous with traditional music. This model is known for its superior fluency, better range and greater ease when changing from one key to another, and they are pivotal in the line-ups of all truly great Scottish and Irish Ceili bands. The 1970s revival of Traditional Irish Music also boosted the profile of this instrument, and its playing style has evolved notably over the years, with many contemporary musicians favouring a lighter playing style with a base that is more varied in terms of rhythm. The concertina is a close cousin of the accordion and falls into the ‘free-reed’ category of Celtic instruments. It has bellows and buttons on either end, and when depressed the buttons and bellows move in the same direction. The instrument was originally developed simultaneously in Germany and England, where it was sometimes referred to as a ‘squeeze box’. To this day the ‘Anglo’ version is used in many Irish Traditional Music bands. During the 1830s, the two versions were marketed as two individual types specific to their country of origin. As the instrument grew in popularity, the designs of both evolved into the hybrid (Anglo) form we see today, despite the fact that the noticeable difference in cost led to a class split between them: the German version being regarded as a working-class instrument, while the English one was more associated with the upper classes. Over time, it was the German instrument that began to become used in popular Ceili dance tunes, while the more sedate English one was more classical in nature. 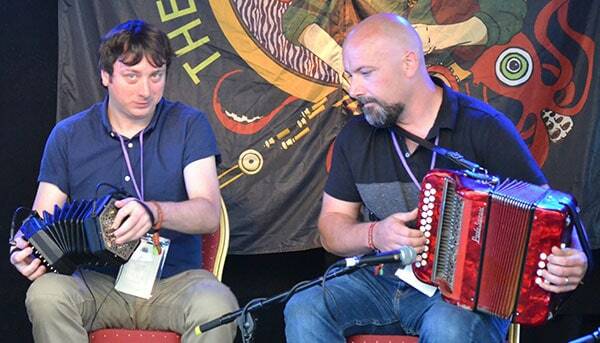 The Concertina and Button Accordion being played at The Doolin Folk Festival 2016 by two of the members of the eight piece band Moher. Throughout the first half of the twentieth century, the increasing popularity of the accordion and the growing mass production of a range of other instruments led to a sharp decline in interest in the instrument, and it almost became obsolete. Though a few instrument manufacturers continued to produce them, the cost of doing so soon became prohibitive – a situation that was not helped by the inter-war period, when the awful escalation of Nazism pushed the instrument into musical oblivion, its identity seemingly lost for ever. That being said, the, folk revival of 1960s resulted in a resumption of interest in the instrument, with the English version in particular becoming more prominent in many traditional Irish Ceili bands. Today, music involving it in a key role is played right across the UK. This instrument is available in a number of different configurations. The version most often seen in Irish music is the Anglo system. The most obvious characteristic of this particular system is the fact that each individual button produces a different note, depending on whether the bellows themselves are being expanded or compressed. This type will most often have either three or two button rows, with an additional ‘air button’ positioned close to the right thumb that lets the player soundlessly empty or fill the bellows. A two-row Anglo version will typically have twenty buttons configured in two rows of ten each. An instrument of this type is not often used to play traditional Irish music because the set-up makes the range of accidentals available rather limited. A three-row model has an extra row of sharps and flats (accidentals) plus some redundant notes (that is, ones that duplicate those in the other two rows), allowing the instrument to be played in almost any given key. One result of this is that the players will often find themselves having to change the bellow’s direction, which results in a crystal-clear gap between the sounds of the two notes. This lends itself well to the more staccato rhythm of a traditional jig or a hornpipe. Conversely, the notes on the English style of instrument sound the same whichever button is depressed, regardless of the bellow’s position. This means that the selected note can be played whether the bellow is compressed or expanded, so a sequential chain of notes can be played without the necessity to alter the direction of the bellow. Putting aside the characteristic liveliness of the Anglo version and the smoother effect achieved by the English style, a talented Irish musician is able to achieve both effects on both instruments. As is clear from the enduring popularity and fascinating history of the concertina and the accordion, some Irish Traditional Music instruments are able to make a triumphal comeback despite all the odds. Artistic principles which have led to the revitalization of interest in the instrument in more modern times have saved instruments, including the Button and Piano Accordion, that could have in other circumstances been lost forever. Key Irish Traditional Music and Ceili players of the instrument include Kitty Hayes, Tim Collins, Mícheál ÓRaghallaigh and Mary MacNamara. Liam Clancy (of Makem & Clancy and the Clancy Brothers fame) played the concertina right up to his death in the year 2009, while distinguished players of the C#/D accordion include Charlie Piggot, Sharon Shannon, Joe Burke, Máirtin O’Connor and Johnny O’Leary. And, of course, the contribution of the many Button and Piano Accordion players to the genre should not be underestimated either.